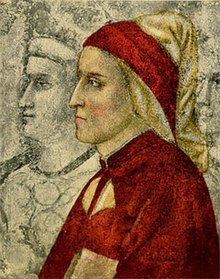 Dante Alighieri (Mey/Juin c.1265 – September 14, 1321), commonly kent as Dante, wis an Italian poet o the Middle Ages. He wis born in Florence; he dee'd an is buried in Ravenna. The name Dante is, accordin tae the words o Jacopo Alighieri, a hypocorism for Durante. In contemporary documents it is followed bi the patronymic Alagherii or de Alagheriis; it wis Boccaccio who popularized the form Alighieri. His Divine Comedy, oreeginally cawed Commedia bi the author an later nicknamed Divina bi Boccaccio, is aften considered the greatest literary work componed in the Italian leid an a masterpiece o warld literature. In Italy he is kent as "the Supreme Poet" (il Sommo Poeta) or juist il Poeta. Dante, Petrarch, an Boccaccio ar an aa kent as "the three fountains" or "the three crouns". Dante is an aa cawed the "Faither o the Italian leid". Wikimedia Commons haes media relatit tae Dante Alighieri.